Flying into Puerto Vallarta is actually something I enjoy. It’s probably the knowledge that I’m at the very beginning of my vacation and I could care less if it’s one of our shorter trips or if it’s a longer stay. I’m sure I’m just settling in to knowing that once I get out of the plane my vacation can finally begin. 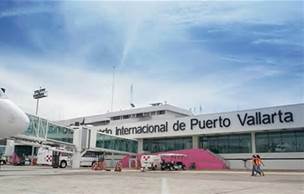 We’ve been flying into Puerto Vallarta for over a decade now and we can confidently say that the Lincoln Diaz Ordaz International Airport has grown from what used to be a small airport to a modern full scale operation with even more plans to expand. Guess that’s the price we pay as more and more people discover this magical city. But even with progress, some of the old rules still apply and we thought it would be useful to share some of the insider tips we’ve learned over the years with our guests to help explain and expedite the Puerto Vallarta airport experience. No means no. Once you’ve got your luggage and pass through customs you will exit through sliding doors and get the first sense that you’re in Puerto Vallarta. On both sides of you will be pleasant Mexican men and beautiful women in traditional dress representing numerous time-share resorts you have wisely decided to avoid to this point. Continue along that wise path by staying focused, moving forward and politely ignoring requests of a ride or questions about where you’re staying. If you don’t you could end up in a prolonged uncomfortable timeshare pitch. Keep heading straight through the doors until you see sunlight. Outside is where you want to find your transportation. Time shares in Mexico are no different than time shares in the US and if you were headed to one of them, well…you wouldn’t be reading a blog on Casa Aventura’s website. No one will be rude, but you don’t want to be either and the best way to avoid the situation is to not make eye contact and move quickly. Catching a cab, van or having a ride waiting. Casa Aventura staff can have a car and driver waiting for you with a name placard and driver eagerly searching for you if you’d like. Some guests prefer this method since it’s quick, simple and not a whole lot more expensive (approximately $60 USD for a car and $90 USD for a van). If this is your preferred route – no problem, just let us know and we’ll have a car waiting. The most common option is catching a cab. Once outside, your business is in play and you will be approached by at least a few cabbies vying for your fare. I’ve found the best way to negotiate the best price is to loudly say “How much to Conchas Chinas?” and turn the negotiating over to the drivers. They’ll quickly race to the bottom and your best rate will be set for you (figure on $40-$50 for a cab ride – that’s per car if you need more than one so if it’s a larger group a van is usually the best option). You can use the same negotiating strategy with van drivers just add ‘van’ to your loud question. (Van $60-$80 USD). Incidentally, every cab driver in town knows where the Conchas Chinas neighborhood is. It’s like saying ‘Beverly Hills’ at LAX. Hand them the address and the fare upfront (they have to pay to get out of the airport lot). Just like that you’re on your way and only 15-20 minutes until you’re poolside with a cocktail in your hand. Cross the bridge. The last method of travel is one our regular guests employ because it’s usually more than half off and once you’re comfortable in Puerto Vallarta it’s really easy. You’ll know you’re a Puerto Vallarta regular when you get to Casa Aventura this way. Until then, if you don’t mind a small adventure we recommend it but only if you don’t have heavy luggage or if your bag has wheels. Some other quick notes: if you’re arriving before others and plan to meet them at the airport before heading to Casa Aventura there are some small airport cantinas just before you exit the airport. Great domestic (that means Mexican now!) beer selections and plenty of soccer on the TV. The longest lines tend to be at immigration where you get that Mexico stamp on your passport and make your vacation official. We’ve seen it completely packed and completely empty depending on flight arrival times. The baggage check lines are usually quick and painless and customs is in the same area and often quicker. Puerto Vallarta has a really easy airport. It’s a great start to what will be a really easy vacation.